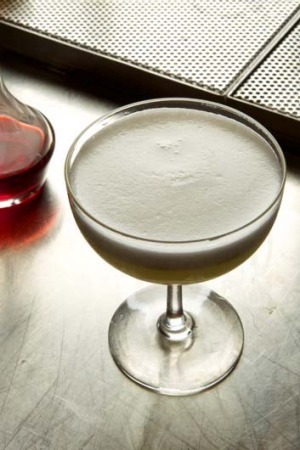 One of the greatest things about living in the second golden age of cocktails - the first being in the late 19th and early 20th centuries, when the genre was defined and refined - is seeing the dignity of the cocktail restored. Not so long ago, the word ''cocktail'' was mostly shorthand for cartoonish, creamy abominations, gaudily, garishly overgarnished, served in a glass the size of a baby's head and sweet enough to send you into a sugar coma. And let's not talk about hangovers. Now, thanks to a grab-bag of factors - hit TV shows Mad Men and Boardwalk Empire, the internet's ability to uncover even the most arcane liquor, a thirst for (and a boom in) artisan-distilled booze, a generation of bartenders intent on lifting the profession's game, the loads of vintage glassware discovered gathering dust on op-shop shelves - cocktails have been restored to their rightful place as good-time, high-style refreshment for grown-ups. 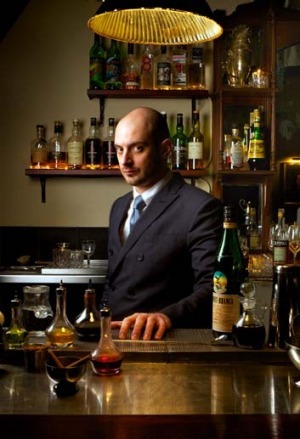 The small bars of Sydney and Melbourne, which pride themselves on their mixing skills, are great first ports-of-call for anybody wishing to learn about cocktails in the post-Fluffy Duck and Harvey Wallbanger era. 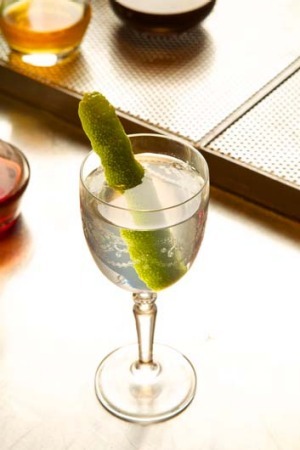 But while ordering classic cocktails by name in a bar brings with it an innate feeling of Rat Pack-ish cool, making them at home for guests cannot help but make you appear more glamorous and ''on trend''. But how to stock the cocktail cabinet? Too many bottles and you risk looking like an alcoholic geek who needs to get out more. Too few and your one-trick-pony routine tires very quickly. Too disparate and your alcohol won't play nicely with each other. What you really need (aside from a decent cocktail shaker) is some versatile booze, familiar and unfamiliar, a few foolproof recipes and a little advice from some talented professionals. This is a great standard rye whisky, essential to any home cocktail cabinet. It's a dry, grassy, slightly spicy drink that's 100-proof (meaning it has a 50 per cent alcohol content), making for nice, strong, boozy drinks. Non-seasoned rye drinkers may find it too aggressive to drink straight, but it's great in cocktails, especially in a Manhattan when you team it with the right sweet vermouth (such as Cocchi, from Italy) that brings out the whisky's complexity without bullying it. This is a party starter that's made in Italy. It has its lovers and haters because of its confronting bitterness and its strong herbal and medicinal flavours. It was originally distilled to aid digestion and it still makes a great after-dinner drink - stiff and boozy but not too heavy. People drink it straight up and others might drink it with Coca-Cola (it's not known as the new Jagermeister for nothing), but I think it works best when mixed with something else and mixed properly so you can still taste it, but it's calmed down a little so it's not so aggressive. 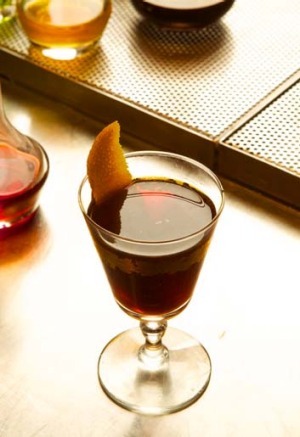 Made right, you should still be able to taste the rye and the Fernet-Branca. Add the orange oils from the twist and you have a great marriage and a perfect post-dinner cocktail. Stir over cracked ice (but don't overstir as it will dilute the drink) and then strain into a coupe glass (shallow, stemmed) and garnish with the orange. Campari is a true classic and an imperative in every home cocktail cabinet. It may not be for everyone straight from the bottle because its bitterness can be a bit intimidating, but it's a super-versatile drink and is great before or after dinner because it works really well for stimulating hunger and as a digestive. It's not so high in alcohol, so it also works for lunchtime barbecues where you can mix it with soda. 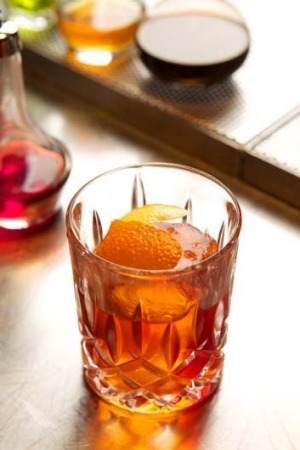 But the best thing about Campari is that if you've run out of all your other fancy cocktail ingredients, you can always make a Negroni, one of the simplest and best cocktails around. This is a gin that, quite simply, makes everything better. It's one of the new-style gins called western dry and has a freshness and a lightness you won't find in your standard London dry gins. There are some floral notes to it but it still has a great backbone that's up to the job. 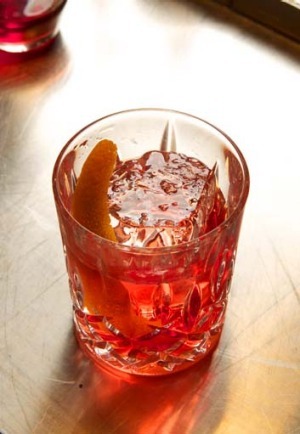 Of course, you can use it in a Negroni but I think the London dries do that better. Martin Miller's makes a cracking gin and tonic but it's also excellent in classic cocktails, particularly when it's front and centre, like in a martini. For me it just adds an extra dimension and a certain je ne sais quoi. The Negroni is one of those drinks that gets a bit overthought but, like all of the great cocktails, it doesn't need special handling. I like to make it as they do in Italy, with everything in equal parts and with a slice of orange as a garnish. Build the drink in a glass with ice and then garnish with the orange slice. It's great to see tequila coming back into the fold. It's a drink that's often been misused and abused and so it's great to revisit it when you're not drinking it in shots. I think everyone should have a really good tequila at home and I like the Tromba blanco because of its freshness. There's lots of agave in the flavour, and sweet lime and honey accents, so it's a smooth, warm drink, great for sipping, like you would a whisky but without any oak getting in the way. It also makes a great cocktail, including - and beyond - a Margarita. I had to mention this one because I helped develop it with the 666 guys in Tasmania. We get the butter from the farm next to the distillery and we use that in a fat-wash process followed by repeated clarifying that gives the vodka a mellow buttery background flavour. The idea was inspired by the hot-buttered rum cocktail, which is a great drink but not so great when it cools down because it starts to split. It can look pretty awful. This butter vodka is completely clear and is smooth and mellow on ice and great at the end of the day. It's also excellent in an espresso martini. I really like to drink this cocktail in winter. It's fresh and warming and the lime adds more refreshing notes. Stir the ingredients with the ice in a cocktail glass. Garnish with the lime. There's a huge variety of gin available now and some of them have become incredibly complex, with nearly 20 botanicals. 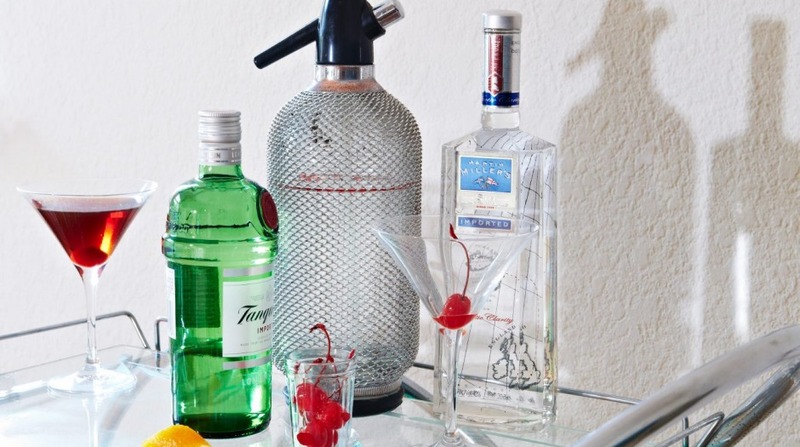 That's fine if you're after complexity, but I'm a simple guy who likes to get slapped in the face with juniper when I'm drinking gin and so Tanqueray gets the nod for the home cocktail cabinet. Tanqueray is a London dry gin and is made with just four botanicals - juniper, coriander, angelica root and liquorice. It's a little higher proof than some, so it not only packs a punch, but it's also great in terms of value for money. And it makes an incredible martini. This is not an alcoholic drink (though we do fortify it with a little grain spirit at Bulletin Place, which helps preserve it) but it is a great alternative to adding sweetness to cocktails as a substitute for honey or sugar. It has a good all-round sweetness but it's made from almonds and orange blossom so its main flavour is a sort of incredibly nutty marzipan that's really deep and rich and reminds you of a Christmas cake. You can add a dash of it to a Tom Collins instead of sugar and it adds a nice nutty, blossomy edge to that drink. You can also mix a spoon of it into your morning coffee. This is a great cocktail that achieves a sort of complexity through simplicity. Put a bit of effort into the shaking with this one - a hard shake for 15 seconds should do it. Put all the liquids and the ice into a cocktail shaker, give it a vigorous shake and then strain into a chilled martini glass. Garnish with the lemon peel. Every home bar should have a single-malt whisky that's easy to drink on its own and happily mixed into a classic cocktail like an Old Fashioned. I like Ardbeg Uigeadail (pronounced oog-a-dal) because it's such an easy-drinking whisky and I feel that it really likes me. It's the one I drink when a reward is needed at the end of a long day. It's a really peaty whisky that's been finished in sherry casks and so it has some savoury notes, but it is sweeter than a lot of other single malts. It also has a wonderful complexity and some extra body because of the sherry-cask finish. This is an Italian maraschino liqueur that tastes like cherries. It's an old style of liqueur that's been around for a long time and shows up in many classic cocktails. It is made from sour marasca cherries and so has nothing to do with really sweet bright-red maraschino cherries. The flavour is bitter-sweet and works well with rum, gin, rye and bourbon. You can mix it with dry vermouth and make a Humpty Dumpty, with white rum and lemon juice to make a Beachcomber or with gin and lemon juice for an Aviation. The good thing about it is that most people won't know what to do with it, so you're always bound to find half a bottle of it in the back of the cabinet. This is the ultimate flexible cocktail and should be in everyone's repertoire. Some say it should only be made with rye but you can also use rum or Irish whiskey. Put the sugar cube into an old-fashioned glass (short tumbler) and douse it with the bitters. Add the whisky and stir down until the sugar dissolves. Serve straight up or on the rocks and garnish with orange zest (traditional) or, for this particular whisky, a maraschino cherry.